Lisa Johnson's paintings inquire into space and movement within the context of landscape painting. Through her ethereal and sculpted pigment Johnson depicts vast landscapes where figures seem to poetically emerge. Drawing inspiration from on-location studies to develop large studio works, her paintings weave geographic, corporeal, and abstract sensibilities through layers of atmospheric grounds and gestural mark-making. Her work speaks to the passage of time over an evolving landscape painted with spirit and musicality. While Johnson was born in Toronto, her family’s roots in the shield country of North Frontenac – specifically Bon Echo, Mazinaw Lake -- continue to serve as one of her prime sources of inspiration. Bon Echo is a stunning 100 meter pre-Cambrian cliff a mile long the rises straight from the dark waters of one of the deepest lakes in Ontario. This is a location that has drawn artists for centuries – from Algonquin artists who created pictographs along the meeting of rock and water, to the group of seven members who painted at this location during the heyday of the “Bon Echo Inn”. 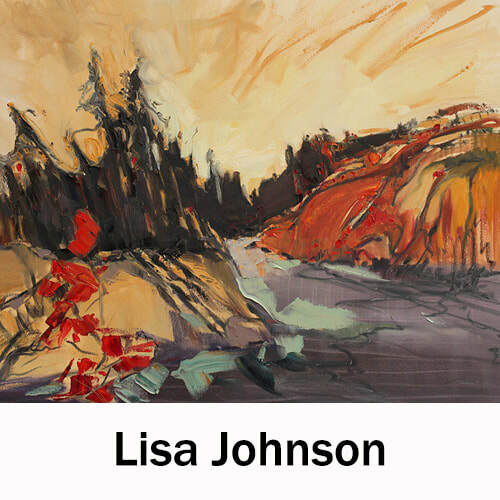 It is a magical Canadian landscape that Johnson sees as a powerful reminder of nature's spirit and poetry and a potent muse for ongoning painterly enquiries. During her years at OCAD, she was particularly influenced by painting studies with Tom Dean. An inspirational line can also be drawn from Joyce Wieland, for whom she worked while Joyce was preparing for her AGO retrospective. Studies in Italy and Berlin have also influenced her work. Johnson's painting plays with the techniques of the old and new masters, from de Kooning and Soutine to Tom Thompson and Susanna Heller. While her gestural approach shows an affinity for action painting, she also draws on elements of a Baroque aesthetic to add drama and emotion. Johnson creates theatrical worlds of wilderness landscape -- passionate dramas expressed with the visceral physicality of paint in a gestural dance.